Stick figure drawings, by definition, dont transmit much information. Neither does low framerate videos (of what this is kind of). Many forumers want to offer theories of what is being represented in the comic, but until time allows more information to come(since a change in the drawing style ins not exepcted), any hypothesis need to be heavy in assumptions -- and much probably wildly off. That theory offering seems not to be only a "want" but almost a "urge". I dont know psychology, but I'm sure there is an article in Wikipedia about that. Did it not change this half-hour, or are they simply staring at the castle? Use "they". Using it as a gender-neutral third-person singular has been around for a long time, is very commonly used in literature and in everyday discussion (most people don't realise they say it, but they do), and is easily understood. This reminds me of "The Marshmallow Test" Preschoolers were given a marshmallow. They were told they could eat it right away. But if they delay eating it, they will be given an additional treat. The researchers were interested in finding out how the kids managed to keep from temptation. Did they fidget? Or sing? Or put the marshmallow out of sight? When the researchers followed up with the kids after they became adults, they found that those who were able to delay gratification were significantly more successful in life. They had higher paying jobs, relationships that lasted, etc. Those who could not had higher incidents of crime, higher body mass index. So, how are you dealing with the delay in gratification? It did change, but just slightly. It appears they've finished the castle. I wonder what comes next. Time to relax for 19 more minutes. Reecer6 wrote: Did it not change this half-hour, or are they simply staring at the castle? The castle needs a flag. Two people have posted that they were redirected to the first image. If that happens, right click and copy the image url, because we currently do not know what it is. Also it seems fairly likely that someone right clicked and viewed the first image in its own tab during the first half hour. If you might have done that, check your internet history if the url is there. If you sort by name alphabetically, remember to check origin, because that is what the urls were at first. bugefun wrote: Two people have posted that they were redirected to the first image. If that happens, right click and copy the image url, because we currently do not know what it is. This happens on my Android phone, at least I think it's the first image. Yeah, I believe that 8eb156cce is the first frame. Maybe we should give them all pet names. Can OP quote this on the first post? Primis is owed much of internets. "Testing the water", building a castle together, looking at it and thinking about it.. I think (and hope) anian is right. arjan wrote: "Testing the water", building a castle together, looking at it and thinking about it.. Especially if you consider the alt text. What's holding the overhanging parts of the castle up against their own weight? Sand of unusual stickiness? Or are they indeed in a low gravity environment? Some grumpy editor removed the "current" template from http://en.wikipedia.org/wiki/Xkcd though it was totally accurate. I have to say, I lurk here for all of Randall's high concept strips but this one actually made me register, and because everyone else is offering their take on it, here's mine: I think/hope this will be a 24 hour strip and that it'll repeat for those that may have missed it today. orthogon wrote: What's holding the overhanging parts of the castle up against their own weight? Sand of unusual stickiness? Or are they indeed in a low gravity environment? This is pretty common for sandcastles. Wet sand can hold quite sizable overhangs and intricate shapes. just google image search "sandcastles". arjan wrote: Some grumpy editor removed the "current" template from http://en.wikipedia.org/wiki/Xkcd though it was totally accurate. Said editor was entirely correct in doing so. The main purpose of the Current tag is to add information pertaining to a newsworthy event to the Current Events category, or a subcategory thereof. It can also be used in extreme cases in which hundreds of people are editing an article at once. Neither applies here. Well, this is really fascinating. We all really have to wait for the next image. No cheating. how much time can you spend watching a single xkcd comic before unpleasent things start to happen? We all know how this is going to end, right? 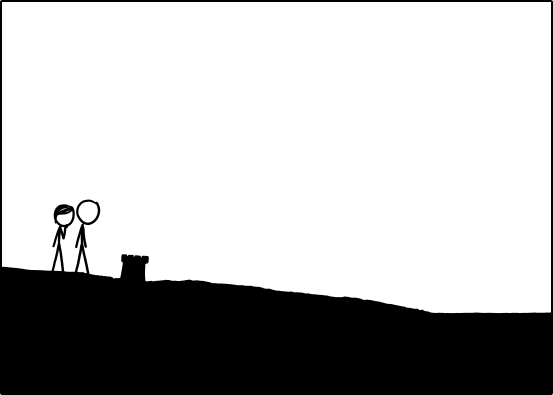 Zecrag wrote: how much time can you spend watching a single xkcd comic before unpleasent things start to happen? Depends on your definition of "unpleasant"
They just stood up! That was pretty abrupt. For an occasional reader of Wikipedia like me "This section documents a current event. Information may change rapidly as the event progresses." doesn't say technical stuff like "this article can also be found in a category" or "many edits are being made right now". It says: "hot news going on here, check back soon". Anyway, I just wanted to point at a tongue-in-cheek joke on the XKCD Wiki page I found funny. Sorry about that. This reminds me of the folks who took Beethoven's 9th symphony and electronically stretched it to 24 hours. It is beautiful and maddening. Ok, Checking in over a few hours shows it's definitely slowly changing. I saw sitting by sand castle and now standing by sand castle. I hope he shares the entire range at one point. Depends , Are you at work? Where's your boss? You win the Internet today sir, For beneficial service to all. Chrisfs wrote: Ok, Checking in over a few hours shows it's definitely slowly changing. I saw sitting by sand castle and now standing by sand castle. I hope he shares the entire range at one point. I hope he doesn't. In fact, I'm pretty sure he won't. That's the purpose of the comic. It's almost 23:00 GMT now. For those of you who will still be awake while this thing goes through its final frames, can you please post the addresses of the frames right up to the end, as far as possible to? I think this thing will post its very last frame at either 07:30 tomorrow or 08:00. All times GMT. At least, that's the guess I would hazard. I think Megan's just starting a new sandcastle. I must admit, this has definitely got me hooked. I really would like to see how this ends - and, more importantly, what message Randall may be trying to convey. Oh my God, watching this comic is so thrilling and... time consuming. And it actually kind of resembles the time you are just lying on the beach, building a castle and the day seems to never end. Except it doesn't. THIS is soooo much slower. You were never building a sandcastle, weren't you? I can imagine them looking back at it saying "WE made this"
Also, no need to refresh, it does for sure update the image automatically. That's the second frame. As far as I know, no-one has kept (and shared) the URL of the very first frame. Unless it loops at some point (which I expect it will), then that's lost to time. Last edited by phlip on Mon Mar 25, 2013 11:13 pm UTC, edited 1 time in total. I think they may be waiting on something. Towards the beginning, the guy walked to the water. I believe that something/someone will be coming by boat/ship and they are just killing time. Dang it, Randall. I was trying, up to this point, to catch up on Quake II.